It is never too late to become an entrepreneur, it seems. 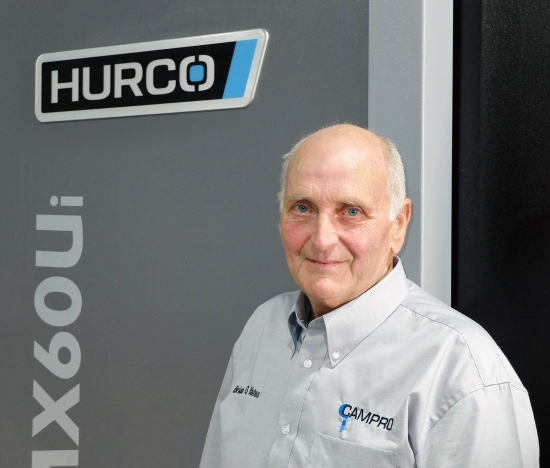 Brian Yates, a machinist since he left school and latterly a manager in a subcontracting firm, decided in October 2010 at the age of 55 start his own business, Campro Precision. He invested all his pension fund in renting premises and purchasing two Hurco machine tools, a 3-axis VM20 vertical machining centre and a TM8 CNC lathe. His son Peter joined him almost immediately and Dewi Hughes started one year later as a third, equal partner. Six years on and the company is going from strength to strength. It now employs two more staff, having moved in early 2015 to a much larger, 500 m² factory unit on the J Reid Trading Estate in Sandycroft, Deeside. Milling and turning for the medical sector account for around one-third of turnover, aerospace contracts are another 20 per cent and the remainder is spread across a wide range of industries. Testament to Campro Precision’s success and a vindication of Mr Yates’ decision to risk everything on the venture is the company’s recent purchase of two large-capacity Hurco machine tools. In 2014, a powerful TM12i CNC lathe with a 12-inch chuck was purchased, differentiating the subcontractor from most of the competition in the North West. It allows turning of larger components up to one metre in length by 550 mm diameter, such as brass oil sump cylinders, stainless steel rings for the oil and gas industry and wheels for sandblasting equipment. Then just before Christmas 2015, a VMX60Ui trunnion-type, 5-axis machining centre with a 1,524 x 660 x 610 mm working envelope was installed, taking the firm into a new realm of prismatic machining. Nobody in the company had any experience of 5-axis work, including Brian Yates, who is a turner by trade, but the technology was picked up quickly by the three partners. They all commented that shop floor conversational programming of 3+2 axis cycles is intuitive using the WinMAX software in the control, based on their experience preparing 3- and 4-axis programs on the other machining centres. More complex simultaneous 5-axis routines can be prepared using the company’s OneCNC CAM system. Dewi Hughes mentioned a job produced on both the VMX60Ui and the TM12i lathe, namely production of steel hubs for overhead cranes in use by Airbus at nearby Broughton. The former production route was one operation on the smaller TM8 turning machine, another on the VM30, back onto the lathe to complete the turning and a further two set-ups on the machining centre. These five operations, which remove well over half the volume of the billet, have been condensed into two on the larger machine tools. Total prismatic metalcutting time is similar. However, the 55 kW / 2,800 rpm spindle with chiller on the TM12i drastically reduces the time needed to turn the component from two and a half hours down to 30 minutes. In addition, there are big savings on inter-machine handling and workpiece set-ups, particularly on the 5-axis VMX60Ui. The first component to be put on the latter machine, at the end of 2015, was an aluminium bracket that forms part of equipment for the electronics industry. It is an ongoing job and another example of the cost reductions that can be made in handling, setting and work-in-progress using 5-axis strategies. Measuring 120 mm x 100 mm x 90 mm, the component was previously machined in 45 minutes on the 3-axis VM30 in four set-ups. The number of operations has reduced to two and the total cycle time is now less than half at 22 minutes. It is down to the higher feed rates and 12,000 rpm spindle speed on the 5-axis machine, as well as its ability to position and clamp the two rotary axes in-cycle to allow efficient 3-axis metalcutting in any orientation, without the need for expensive fixtures. Peter Yates commented, “We run a day shift from Monday to Friday, 6.00 am to 6.00 pm, sometimes longer, and there always seems to be enough work to fill the Hurco machines. 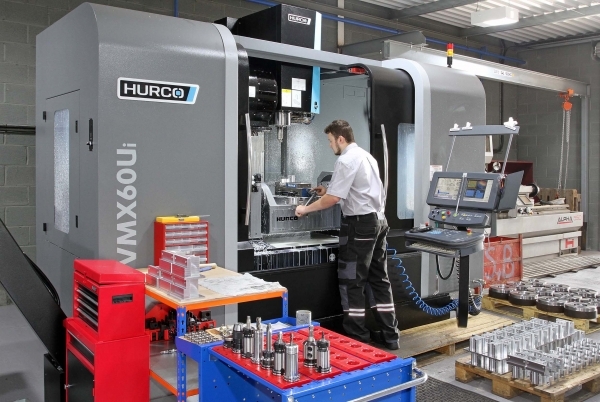 “We operate two lathes and three machining centres, including a VM30 with 4th axis we acquired in 2011, and they have never stopped since they were installed. When Brian Yates started the company six years ago, he already had experience of using Hurco machines during his previous employment. The WinMAX conversational programming software in particular was an attraction, as it reduces set-up time and cost for new components that might only be required in ones and twos. He added, “Hurco machines are easy to master. All the operators where I worked before were keen to use them, so it was an easy choice for me to follow suit when I started my own business. They are high performance machines.